The results of the 11th voting on CoinDeal! It has got 6967 votes in total. We are pleased to inform you that the chosen cryptocurrency will be added to the exchange in 4 weeks time. Soon, all the users of CoinDeal will be able to trade on the new market! We are very happy that another coin chosen by you will be added to our platform. We are sure you’ve made the right choice this time again! Sadly, this time the coin that had gained the highest amount of votes had to be disqualified by the administrators according to the voting regulations ($3, point 4). The first place was taken by the crypto that received the second highest score! By continually checking compliance with the regulations, we make sure that every single cryptocurrency available on CoinDeal meets the criteria relevant to our users. Maintaining high standards is very important to us. If any of the new cryptocurrencies do not meet them, they will not be added to our platform. For safety reasons, account verification on CoinDeal is a multi-stage process. Each user who has passed the second stage of verification can vote for a new coin. The correctness of the vote depends on the next level of verification, within which the authenticity of the completed data and provided documents are verified. As part of the verification of users, who voted in the 11th poll, we set that several thousand votes for Eunomia Coin were from accounts violating the voting and user verification rules. 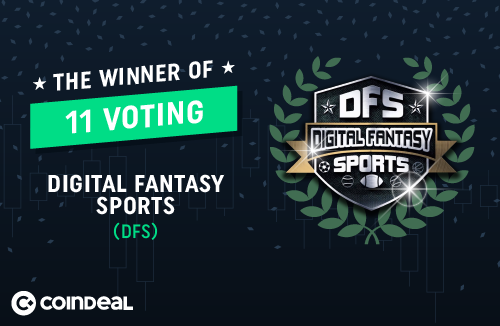 We hope that you will like trading with Digital Fantasy Sports! Join the new market as soon as it’s available and make some transactions!